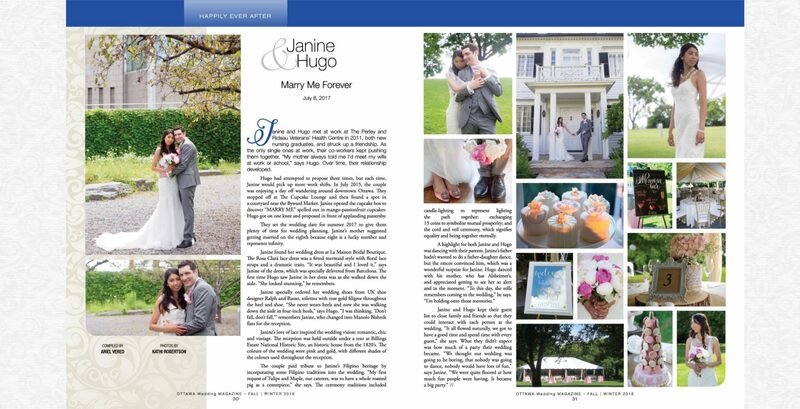 My latest spread in Wedding Magazine features the lovely Janine and Hugo who tied the knot at Billing Estate. Janine and Hugo met at work a The Perley and Rideau Veterans’ Health Centre in 2011, both new nursing graduates, and struck up a friendship. As the only single one at work, their co-workers kept pushing them together. “My mother always told me I’d meet my wife at work or school”, say Hugo. Over time, their relationship developed. Hugo had attempted to propose three times, but each time Janine would pick up more work shifts. In July 2015, the couple was enjoying a day of wandering around downtown Ottawa. They stopped off at The Cupcake Lounge and then found a spot in a courtyard near the Byward Market. Janine opened the cupcake box to discover ‘MARRY ME’ spelled out in mango-passionfruit cupcakes. Hugo got on one knee and proposed in front of applauding passerby. They set the wedding date for summer 2017 to give them plenty of time for wedding planning. Janine’s mother suggested getting married on the eighth because eight is a lucky number and represents infinity. Janine found her wedding dress at La Maison Bridal Boutique. The Rosa Clark lace dress was a fitted mermaid style with floral lace straps and a dramatic train. “It was beautiful and I love it”, says Janine of the dress, which was specially delivered from Barcelona. 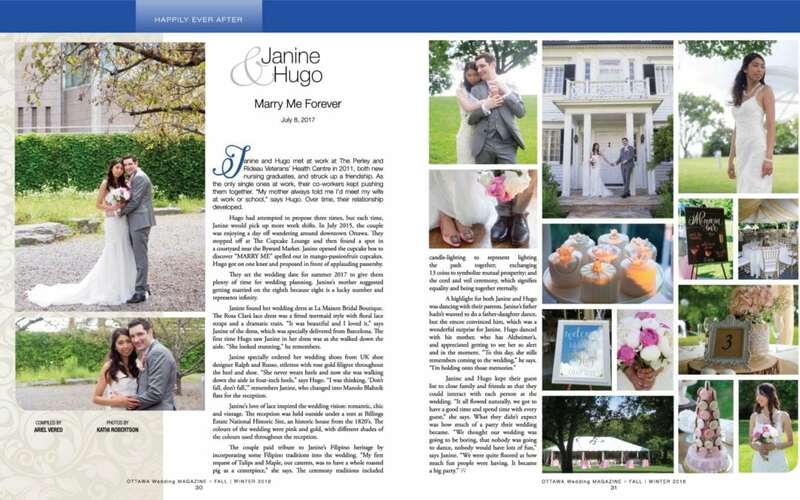 The first time Hugo saw Janine in her fress was as she walked down the aisle. “She looked stunning”, he remembers. Janine specially ordered her wedding shoes from UK shoe designer Ralph and Russo, stilettos with rose gold filigree throughout the heel and shoe. “She never wears heels and now she was walking down the aisle in four-inch heels”, said Hugo. “I was thinking, ‘Don’t fall, don’t fall’” remembers Janine, who changed into flats for the reception. The couple paid tribute to Janine’s Filipino heritage by incorporating some Filipino traditions into the wedding. “My first request of Tulips and Maple, our caterers, was to have a whole roasted pig as a centerpiece”, she says. The ceremony traditions included candle-lighting to represent lighting the path together; exchanging 13 coins to symbolize mutual prosperity; and the cord and veil ceremony, which signifies equality and being together eternally. A highlight for both Janine and Hugo was dancing with their parents. Janine’s father hadn’t wanted to do a father-daughter dance, but the emcee convinced him, which was a wonderful surprise for Janine. Hugo danced with his mother, who has Alzheimer’s and appreciated getting to see her so alert and in the moment. “To the day, she still remembers coming to the wedding”, he says, “I’m holding onto those memories. Want to check out more of my weddings shoots? or Olga and Eric’s Day at Evermore Weddings & Events. Head back to the blog.